Before I start, I’d like to point out that this investigation was conducted by two people – myself and [Howmuch?]. We are both sensible (well, usually) adults and have experience of, and training for, confined spaces. Entering such environments – and storm drains in particular – is a dangerous thing to do. I advise nobody to do it. Water can enter at a moments notice, there can be sudden drops, trips and gas hazards. What we did here, we undertook at our own risk, and in the full knowledge that we were trespassing and could well get into difficulty. Doing so without training, the correct equipment or suitable permission is dangerous, stupid and nobody should do it. Since this blog started, there’s been a huge interest in Chasewater, and it’s dam. The reservoir was built as Norton Pool in the late 1700’s to feed the canal network. It’s worth thinking about this for a while, as it’s quite a concept, and one often lost on the casual observer. The canal system through the towns of the northern Black Country is almost exclusively fed by the 144m O.D. level of the Wolverhampton canal network, which runs from Horseley Junction, all the way through the suburbs of Worverhampton eastwards to Bloxwich and Brownhills in the form of the Wyrley and Essington canal. There is no canal linked to this that is higher – so where this contour canal transitioned to other waterways, downhill locks were employed. There were 30 alone on the Lichfield and Hatherton, for a start. Then there are locks at Longwood, Aldridge, At Birchills in Walsall, and several complex series at Wolverhapton. Every time a boat uses a lock, water is lost downhill. A busy canal, operating as the freight motorway of it’s day, would see huge water consumption. 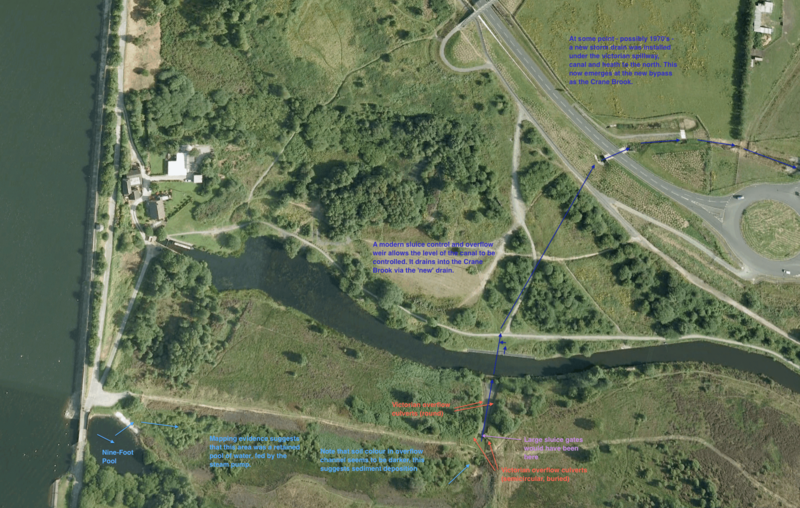 Google Earth aerial imagery with annotations as to the drainage arrangements of the spillway. Click for a larger version. Water was precious, and Norton Pool was built to feed the canal’s voracious thirst. Over the years, the reservoir has been fed by the Crane Brook from the north (as it always has been), and has seen some water pumped into it from nearby mines. Water also seems to have been recovered from the canal at times when the level was high, and following an enquiry rom fellow Brownhills historian Dave Fellows, Chasewater Wildlife Group head honcho Graham Evans has discussed the nature of the pumping and feed arrangement last year. I’m now fairly sure water was being pumped from the coal mines on Brownhills Common into the Slough Arm. I think a mine owner may even have charged for this supply, although I can’t place where I got that impression. Together with other such sources of what would certainly have been very foul water, these contributed to the general canal supply. When the water was at a high level, it appears to have been pumped back from the canal into the Nine Foot Pool (so called because of the measuring scale erected in it). The Nine Foot is the pool on the Canal side of the dam, at the beginning of the spillway basin, designed to take the flow should the reservoir overflow. The spillway in general seems certainly to be as old as Chasewater itself, although alterations and strengthening seem to have taken place in the late Victorian period. Ornance Survey mapping of 1902 showing the area in surprising detail. Note the 'Basin' - now dry - is marked full of water, possibly contained by the market sluices. On Sunday last, after talking about the site for months previously, myself and top local history ferret [Howmuch?] decided to investigate the spillway, and it’s interesting drainage arrangements. To do this, we decided to enter the culverts to see where they went. On the way, we noticed some intriguing things about the civil engineering, and some pointers to the history. Much of this has already been suggested by the wonderful Andy Dennis. The current state of the spillway basin between Nine-Foot and the old sluice gates is stepped in profile on one side rather than a plain trough shape. We think this may be due to sediment dredging. In Google Earth, and on the ground, the land within is darker. We’re thinking this is due to sedimentation from the filthy canal water it would have contained. We’re wondering if the canal water was pumped into the basin to settle out before possibly being allowed to flow back into the main body of Norton Pool. We have no direct evidence of that, just a hunch. The top of the sluice seems to have had lock-style gates. We feel that water probably was retained by them, and they therefore sealed like lock gates. The culverts on either side acted as a level control for the basin, but maybe a drain, too, depending on the location of the upper portals which are now buried. The new storm drain seems to have been built any time from mid-1960’s to the late 1970’s. It’s a classic Reinforced Concrete Pipe (RCP) design. The storm drain runs under the brickwork sluice, under the canal and heath, and emerges on the north of the new bypass as the continuation of the Crane Brook. We think it was built to avoid possibly contaminated washdown or runoff water from the old spillway basin contaminating the then improving canal water. The above seems daft but it’s all we can think. We’re wondering how it was all constructed, and if anyone has dates or photos. In places the brickwork in the sluice seems to have been disturbed and regrouted. The brick sluice is probably now redundant, although in heavy flow conditions I wonder if the basin would backfill as a buffer? I chose to enter the right hand culvert. About 24″ diameter. Don’t do it kids – it’s messy, uncomfortable and dangerous. The culvert cuves gently and travels up the slope. The brickwork is in excellent condition. Not a tight fit, but not comfortable. It seems about 6-8m to the top. As one nears the apex, the channel gets wetter and the debris gets uncomfortable on the belly. Eventually, there’s a chamber at the peak. I think it’s fairly evident that this held a drop-paddle sluice gate. On the far side of the gate chamber is a semicircular culvert, too small to enter, the brickwork forming a perfect lip. Looking upwards to ground level above the chamber. The top is blocked with planks or slabs, and there are guide rails and a control channel for the gate mechanism. Coming out is a long journey. At the dry section, I turned over and came down on my backside. The air was stale and I was glad to get out. The upper main sluice gate post. These, we think, were like lock gates and retained a permanent pool in the spillway basin. The portal to the semicircular culvert is somewhere just to the right in the brickwork – the masonry is falling away due to the cavity below. The culverts are identical both sides. At some point in the last few decades, a storm drain was installed beneath this system. I’m interested in how that was built. The entrance to the storm drain, below the brick spillway. I only noticed this recently, with the help of an old hand. Made of 5 foot diameter RCP, it’s walkable with care. The complex and modern canal overflow is part of the ‘new’ system, the overflow itself being slightly to the side of the drain culvert beneath, which is central to the brick sluice, as indicated by access covers. There’s an access cover at the foot of the brick sluice, central to it. It’s about 2 foot 6 inches diameter and is bolted down securely – presumably to prevent heavy flow from blowing through it. Similar access covers exist beyond the overflow on the far side of the canal. Someone has been here recently – possibly when the canal was drained to rescuer the dredger. Back on top, entering the new drain, it’s reasonably airy and dry in the upper area. After the treacherous downhill of the section under the brick sluice, there’s an access chamber leading to it’s foot. The tunnel becomes damp and the air stale under the canal, before opening into a very large chamber with a sudden drop. Here, the canal overflow ethers the system from above right. I suspect this is designed to buffer heavy flow. Here, you can hear road noise from the bypass. Without a rope, I turned back at the overflow chamber – it was a fair drop down and I didn’t want to risk getting stuck. We found the northern portal – the Crane Brook, effectively – just on the north of the new embankment on the south of the bypass. From here, it winds round the road system before heading toward Stonnall. This entry was posted in Brownhills stuff, Chasewater, Environment, Followups, Fun stuff to see and do, Interesting photos, Just plain daft, Local Blogs, Local History, News, Panoramio photo discussions, Panoramio updates, Reader enquiries, Shared memories, Social Media, Wildlife and tagged Brownhills, Brownhills local history, Brownhills Past, Canal, Chasewater, Chasewater Dam, Chasewater history, Chasewater Wildlife Group, Cycle rides, cycling, Dave Fellows, Graham Evans, local blogs, Local History, nine foot, Reservoir, Staffordshire, steam engine, Steam pump, Wildlife. Bookmark the permalink. I remember standing opposite the overflow with my late mucker in November 2005. I decided to find out more, but for some with enquiring mind these things just pile up. So thanks for the amazing detail! thank you for this amazing article. Very interesting. Hope you had a good long shower afterwards! of course! Try to go to Poperinghe if you can when you are there. I’m trying to get a feel for how much water the basin could hold and how much rain would have to fall to fill it when the reservoir is brim full. Does anyone know what the surface area of the catchment is? And does anyone know what the interception rate is – in other words how much rainwater gets into the reservoir in a short period, assuming it’s the end of a wet winter. My initial sums indicate that the capacity of the basin (0.909 acres and 9 feet deep) is in the region of 6.5 million gallons. This would be filled by 1.5 inches of rain falling on the surface of the reservoir (200 acres) alone. Are these dimensions near enough? Please do correct me. According to Hammerwich Weather 31 mm (1.2 inches) has fallen in April and we’ve had more today. Another way of looking at this is to estimate the rate of overflow from experience. The old weir was approximately 18 yards long and 1 yard wide. Guessing the flow was 1 inch deep and water took 1 second to cross the weir, it would take less than 24 hours to fill the basin if closed. Last time it overflowed for much longer than this. Does this make sense? Again, do correct me. If my numbers are anything like right, the idea that the basin was designed as a flood control measure seems less far-fetched. Hi Andy, thanks for your great work. Sorry, you lost me there a tad. I’ve no doubt the basin/spillway was designed and functioned as an overflow. I’ve never questioned that. What interests me is the sluice gate arrangement and the fact that it was drafted on early aps – and seems to have been fairly permanently – full of water. The weir and breakwater etc. all tell a tale of energy removal in classic style. But why build the slice gates, spillway and such an beautiful twin gate-controlled sluice? This to me seems a late Victorian addition, and is really puzzling me. I still think they used it as a settling pond, but I have absolutely bugger all to back ha up. Sorry, Bob, I didn’t mean to contradict you; just got ahead of myself. “Hypothesis: All of the structures and earthworks downstream of the nine foot pool were purely for control of natural excess water in the reservoir. Test: At the top of the chute, which appears to have been built about the same time as the canal, are some grooves which can only have been part of a sluice mechanism (marked on the 1884 map) for holding water in the basin. A very large amount of water. If this was a response to a flooding incident, perhaps a flash flood, it must have been quite spectacular and there would surely be some exaggerated folk memory of something approaching the Biblical. The only report of such an event that I have heard relates to the failure of the original dam in 1799. If it was considered necessary to hold that amount of water for flood control purposes, why were the grooves at the top of the chute disused for so long? And, designed to 1,000 year standard, why have the newly completed works not included that scale of provision? In any case, the nine foot pool overflows so infrequently – at that for a short time – and appears not to cause any substantial problems in the Crane Brook or further downstream. 1. The plans, maps and pictures I have seen show only one route from the pumping station, that is an “aqueduct” to the top of the dam wall. If water was pumped into the reservoir, it would act as a settling tank and the basin would only come into play at times of flood. 2. The absence of any indication of an alternative route for pumped water. Pumping to the nine foot pool would only fill up the reservoir, except in times of flood, but the mines could flood after heavy rain when the reservoir was low (in August, say). There appears to be no evidence of a route from the pumping house direct to the basin. Going back to “A very large amount of water” I asked myself just how much water and whether it would need exceptional rainfall to fill the basin if the culvert to Crane Brook was closed. I think the answer is no, indeed I think the rain Hammerwich Weather has recorded this month, which is far from exceptional, might have been enough, but I don’t have enough information to be confident. How would the Victorian engineering mind have worked in light of the failure and consequences in 1799? The other factor is how much water was pumped out of the mines? Was this alone enough to require additional overflow capacity? There is still the same difficulty that the basin would only come into play at flood unless filled direct from the mine. Maybe, if water was pumped into the reservoir only, the filtration by reedbeds was only necessary at times of overflow? At least that gets around the absence of a direct route into the basin, but does it explain the capacity of the basin? It was just the early morning train journey fug. Canal level? Harrison’s Cathedral and earlier pits thought to have pumped waste water into the canal. I have the idea that one one owner charged for this, but that may be a flight of fancy on my part. I daresay lots of things discharged into the cut, so there may well have been times when it was prudent to reverse-fill. I’m just fascinated by the complexity of the sluice. I think you may well be on to something with the reed bed thing; but I’m guessing. I honestly don’t then the brick sluice in it’s current form is original. The gate mounts are concrete, and I’d day in practical terms that dates them around the latter part of the Victorian era. Perhaps it started as a pure, unlined spillway and changed with the Anglesey Branch. I’m hoping Graham Evans may pass this way soon. I’d be interested in his view on the matter. I really am open to suggestions here. This is utterly fascinating to me – perhaps in the past they had some other ideas for chasewater and the surrounding areas. Now lost to time , which might account for the engineering there without explanation. Whilst I took my life in my hands going down the nuclear bunker in the dark I doubt I could go through those culverts, I’d be too afraid of getting stuck then water coming down. Surprised that they haven’t put raining on them given H&S nowadays. We had 20 mins earlier and we went to chasewater to see the new works and the levels but it was hammering it down when we got there. I shall try to visit later in the week. This is the first time I have come across your photographs and comments on the spillway at Chasewater unfortunately your warnings came 50 years too late for me, as I explored the culverts & tunnels in 1960. I am just as puzzled as to its original purpose as you are, I surmised that it may have been a way of getting boats from the reservoir into the canal but I could not see how. Hi Bob thank you so much for this info I used to play there in the early sixties and often tyres going down the culverts but never quite made it so this has answered a lot of my queries regarding this. Without wishing to be too much of a pedant, there were three canals which were above the Wolverhampton Level and therefore fed water into the BCN supplementing the Chase Reservoir. 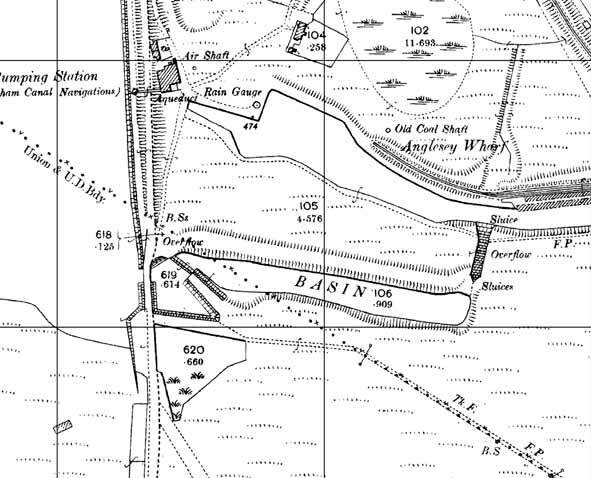 The Slough Arm has been mentioned and had one lock, its water being sourced from the mine on Brownhills Common. The Wyrley Bank Branch which was up the locks at Sneyd, and beyond the Essington Locks bracnch (originally the highest on the BCN). Both were fed by pumped water from the nearby collieries. Finally over on Smethwick the Titford Arm led up to Titford Pools, gathering water from the the area traversed by the Portway Branch Canal. A fascinating look at the Chase Reservoir Dam. Some drive all night in huge and thundering removal vans. My father’s the Chief Inspector of – What? My father’s the Chief Inspector of HOLES. Flippancy always most welcome (and indeed, invited).